Here’s a quick recap of a recent Resiliency Maps mapathon using OpenStreetMap and Mapillary. The idea was to get a bunch of people working together to map assets and hazards with a view to the next emergency. The event was organized with MaptimeSF and hosted in Oakland by the fine folks at GreenInfo Network. 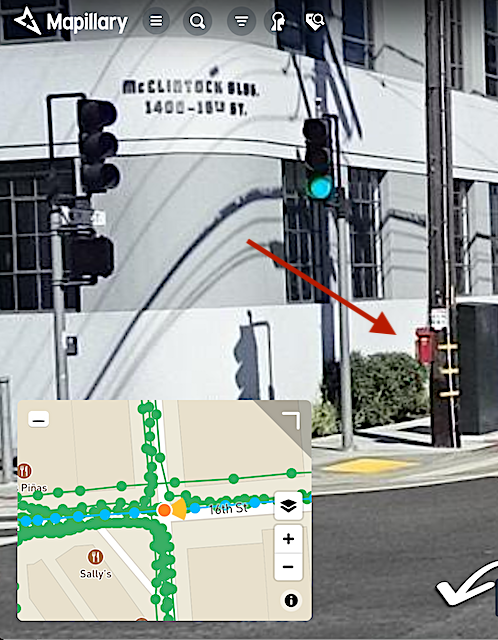 From Mapillary.The red arrow shows a fire alarm call box. It’s kind of an OSM treasure hunt – they’re placed about every two blocks in San Francisco, most freestanding, others like this one attached to a utility pole. It works whether the group can gather info in the field during the session or not. For an evening mapathon in the heart of a rainy winter, this made sense. Bonus: San Francisco is extremely well covered by Mapillary imagery; you’d want to check your area first. Mapillary has a bunch of mapathon materials (even slides if you need them) that make organizing easy and fast. One of the suggestions from the materials is to limit the data targets. We heeded that advice and focused mainly on fire call boxes, cisterns, open spaces for assembly points and potential hazards (construction sites, dry cleaners, bars and restaurants – these last ones for their flammable potential in an emergency.) We handed out a cheat sheet that spells a few things out – since there were just two of us facilitating, it helped to have a reference backup. It works well with a range of experience levels. There were about 25 of us, including a group of GIS students new to OSM who made the trek from the South Bay as part of an assignment as well as a core group of Maptimers already nimble with the platform. 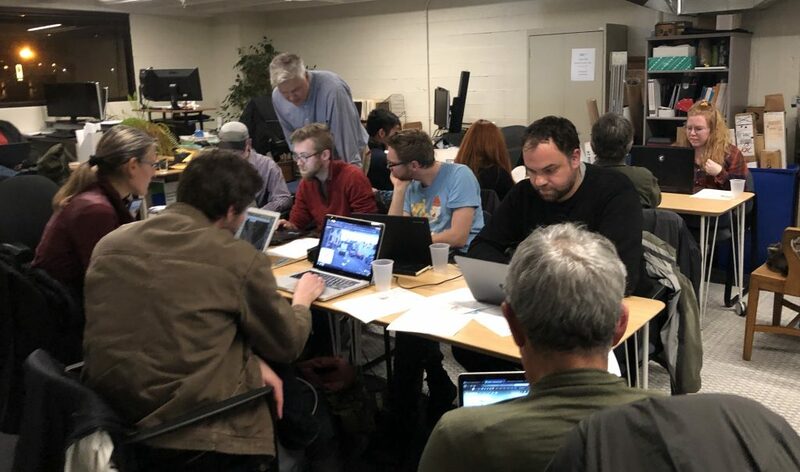 Other participants work in tech but are also new to OSM and interested in making maps of their specific neighborhoods or a couple of people with expertise in health care looking to make resiliency maps from that angle. It’s always exciting to see people who’ve never made an OSM edit make their first mark on the map! Having Mapillary imagery seemed to give the newbies confidence with their first edits – by the time we ended about two-and-a-half hours later they were excited and asking how to do more with OSM. (If you’re looking to get started or refresh, here are some resources.) Many of the experienced mappers had little or no experience using Mapillary to edit OSM, so combining that with our resiliency-specific data targets added something for them, too. In short, if you’re looking to get a mixed skill group of people editing OSM without a lot of time prepping the event, this is a good way to do it. At about 4 a.m the next day, a 3.4 quake centered in Oakland shook the Bay Area awake. A gentle-ish reminder about why making these maps matters!